Hit the slopes. Or snowboard/ski/glide down them. Your choice. 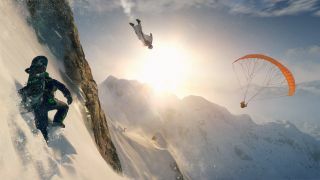 Ubisoft's extreme-getting-down-a-mountain game Steep releases soon, but if you're interested in trying it out early you can enter the open beta right now. Doing that is as simple as firing up Steam and clicking on the big 'Install Game' button here, at which point you'll be able to dive into something that Steam reviewers currently have "mixed" opinions about. My experience of snowboarding consists of the original Cool Boarders, and that minigame in Final Fantasy VII, so if Steep is a bit like that (while offering skiing, paragliding and wingsuiting too) I'll be in my element. This open beta appears to end on November 21, but if you miss it there's only a short wait before we can hit the slopes for real, by which I mean for pretend because this is a game and not real life. Steep is out on December 2, and there's a slope-load of footage available below.